It appears that Danny Ainge has brought him back. If you remember, Ainge was the one who brought him to Boston six years ago. Since then, West has played most recently with LeBron James in Cleveland for the Cavaliers. 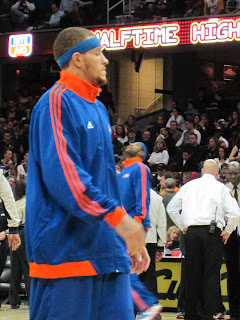 Here's a picture I took with Delonte in the foreground and LeBron in the background. **** Insert your own joke. Cleveland subsequently moved Delonte to the Minnesota Timberwolves where, ultimately he was waived.